Both for the nation and me. The economy - I was one of the very few blogs predicting this and I now call Rep. Lampson and others heroes for voting No Deal. We should now get a temporary fix until a more Democratic Congress and President get in. Remember that FDR refused to negotiate with Hoover until he and a Democratic Congress were sworn-in in March to write new deals that he and the Democrats would be responsible for. Tell Obama we need new Democratic new deals, not the Bush undemocratic bailout. Me - I decided to upgrade the memory on my old main PC to cure some of the problems. I installed the memory and no display. There is no way memory affects the display. I reinstall the old memory no display. I check if I had managed to disconnect something - not that I can find. After about three hours I give up and take it into a place I distrust for an evaluation. "You're not outputing a video signal, do you want us to find out why for $70?" "Go ahead." "We'll call you in a day or two." The last day to register to vote in Texas is next Monday, October 6th. If you only forward one email or one link to your friends, family, and neighbors today -- make it this one. Visit VoteForChange.com, our one-stop voter registration website, and register before the Texas deadline. I really should have more to write about this from an excellent election site but I think it speaks for itself. Thom Hartmann wrote an interesting piece on how to bail out Wall St. without costing the taxpayers a dime. The idea is to create a new government agency to manage the bailout. The treasury would then loan it money to bail out Wall St. firms that are in trouble. The government would then institute a Securities Turnover Excise Tax of 0.25% on stock trades with revenues going to the new agency. For long-term investors who buy stock in companies they believe in and keep it for years adding a quarter of 1% to the cost hardly matters, and even to speculators it is not huge. It is estimated that such a tax would generate at least $150 billion a year, so the $700 billion load would be paid off in 5 years. The US has had such a tax in the past and used it to finance the Civil War, Spanish-American War, WWI and WWII. Many other countries have a similar tax. This proposal is clearly a viable alternative to either giving Wall St. $700 billion as a freebie or even getting stock in return for the money. Wall St. managers might even prefer it to a plan that limited their future compensation. Mother Jones lists yet five more alternative bailout plans. Find the exact quotes from the Palin interview. I think it'll be close and they better have a compromise bill with more limited funding to push it to the next Congress. Kucinich was about to enter a Capitol building meeting room with fellow House Democrats who have been critical of the $700 billion relief measure for the Wall Street crisis. The meeting was organized by Rep. Brad Sherman (D-Calif.) and has been termed the “Skeptics Caucus.” Lawmakers were meeting with well-known economists, such as James Galbraith, economics professor at the University of Texas, and William Isaac, former chairman of the Federal Deposit Insurance Commission. The past week has been one filled with brilliant people trying desperately to accomplish what is extremely difficult (namely, keeping the US out of a depression) and some exceptionally (some might say BREATHTAKINGLY) stupid people who are narrowly focused on the last shreds of a failed ideology. And their own egos. We at McBlogger have done our best to keep up with all the ups. And downs. First up are the always cretinous folks from the American Enterprise Institute who decided to blame the wrong people for the failures of their own plans. Then there was Congressman Jeb Hensarling (R -unfortunately from Texas) who decided his supercharged ego and underpowered little rat-brain had something useful to add. No, he didn't. 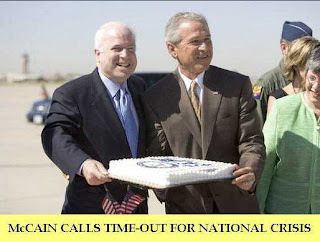 Gary at Easter Lemming Liberal News does not like Bush and McCain's response to the Wall Street crisis. He has some items he wants included in a bailout bill and not bags of money thrown at the problem. Oh, I am not suppose to say that because this is a crisis of confidence. No it isn't. It is the chickens coming home to either roost or peck eyeballs out. Houston and Texas may seem a safe haven now but next year the energy companies will be taxed hard to fund government. Martin Weiss: This is the first stage of the dangerous bear market we've been warning you about. And just as we've warned, the market is being driven down by the single most important sector: Financial companies, the heartbeat of our economy. Nearly every major bank, brokerage and lender you can name is up to its eyeballs in leveraged investments whose value is going up in smoke. They're borrowing hundreds of billions from the Fed. They're raising billions more from investors, diluting their shares. They're selling massive amounts of assets — scrambling any way they can to raise cash to survive. Merrill Lynch, America's largest brokerage firm, has lost more than two thirds of its stock value. Citigroup, once America's largest bank by market cap, has lost even more. Washington Mutual has given up nine tenths of its value. On average, even including the strongest of the banks, half of the wealth of bank shareholders has been wiped out. Old Pancake make-up guy holds his own against the smart college professor. ThinkProgess has a lot of during and after blog posts and links. The rating agencies rated AAA a lot of debt that their former employees acknowledge was junk or not reviewed to drive profits. A must read from Bloomberg. There is a growing grassroots opposition to this current "emergency bailout" crisis. I don't trust any Republican expert to tell me his banker friends need billions of our taxpayer dollars. Yes, capital is freezing up because no one believes the lies about the assets anymore but the DC politician liars aren't to be believed in regards to this bailout. Contact your Washington representatives now and tell them NO to an emergency $700 billion bailout. This economic act funded by taxpayers to rescue Wall Street must include tough regulation, severe consequences, action on behalf of American homeowners who face foreclosure, and oversight by Congress and the Courts. It must also include a gradual transparent mechanism to write down assets to their true market value without rewarding the players who have driven up the price of the hidden assets. Borrowed from The Moderate Voice. Vote early anywhere in Harris County. Here is a great map of the locations. This will start soon - get ready. I am now even more firmly convinced that there really is a predator class. The people responsible for creating and bingeing on the mortgage junk bonds, derivatives and financial insurance scams that are now being bailed out are our society's most educated, highly trained and wealthiest professionals. The Meltdown of '08 was not caused by con men, crazed moguls and panicked masses. It was caused by financial bureaucrats of the baby boom generation who were paid megabucks for office jobs, who wear Patagonia fleece, $12,000 Brioni suits and read books about "reinventing the Self." There is a basic and indelicate question about the unfolding financial crisis that, to my mind, has not been asked loudly enough: Is the ethical and prudential rot so clearly on display in this historic episode confined to Wall Street and the world of high finance, or are other institutions, vocations, professions and commercial cultures similarly infected? US Magazine - McCain uses American Idol make-up artist. Britney Spears tour designer designed McCain's nomination stage. National Enquirer with more details on Sarah Palin's affair - it is with her goateed husband's look-alike but more rugged and more interested in talking and politics. Sarah Palin had a witch and demon fighter minister bless her campaign at her spirit-filled church. This sure is more entertaining that Biden. McCain Latest Lie - "I am rushing back to Washington to deal with this crisis"
McCain seeks to cancel the debate on Friday. Then seeks to cancel the VP debate. The small college where the debate is to be held has spent millions. Then phones David Letterman right before the show that McCain won't be on because he is rushing back to Washington. On the show Letterman talks about McCain, whom he has great respect for, for most of the show but makes fun of his suspending his campaign because he can't deal with more than one thing at a time and evidently doesn't trust his VP to fill in for him. Later in the show he finds out McCain hasn't rushed off to Washington but is doing an interview with Katie Couric down the street. "Hey Senator, can I give you a ride home?" With respect to the debates, it’s my belief that this is exactly the time when the American people need to hear from the person who, in approximately 40 days, will be responsible for dealing with this mess. And I think that it is going to be part of the president’s job to deal with more than one thing at once. McCain aides laughing in the face of a national crisis that "forces" them to suspend the campaign. McCain and Obama issue joint statement on economy - it is pure meaningless platitudes. Then Marc Ambinder discovers Obama had proposed some meat for the statement and McCain said no. These are the principles McCain could not agree to. First, there must be oversight. We should not hand over a blank check to the discretion of one man. We support an independent, bipartisan board to ensure accountability and complete transparency. Second, we need to protect taxpayers. There should be a path for taxpayers to recover their money, and to turn a profit if Wall Street prospers. Third, no Wall Street executive should profit from taxpayer dollars. This plan cannot be a welfare program for CEOs whose greed and irresponsibility has contributed to this crisis. Fourth, we must help families who are struggling to stay in their homes. We cannot bail out Wall Street without helping millions of families facing foreclosure on Main Street. Fifth, we both agree that this financial rescue package should move on its own without any earmarks or other measures. We have different views about the need for other action, but this must be a clean bill. This is a time to rise above politics for the good of the country. We cannot risk an economic catastrophe. This is not a Democratic problem or a Republican problem - this is an American problem. Now, we must find an American solutions. It turns out McCain might have dashed over to Katie Couric to make up for the not-ready-for-prime-time interview Sarah Palin had just given her. The wheels off the bus go round and round - McCain campaign accidentally sends talking points about campaign and debate suspension to the media instead of campaign staff. After McCain suspends his campaign he still meets with the Illuminati representative Lady Lynn de Rothschild. With McCain rushing back to Washington would you suspect he is the most absent U.S. Senator missing 64%, 412, of the votes so far this year? Martial Law for the Election? Beginning in October, the Army plans to station an active unit inside the United States for the first time to serve as an on-call federal response in times of emergency. The 3rd Infantry Division’s 1st Brigade Combat Team has spent thirty-five of the last sixty months in Iraq, but now theunit is training for domestic operations. The unit will soon be under the day-to-day control of US Army North, the Army service component of Northern Command. The Army Times reports this new mission marks the first time an active unit has been given a dedicated assignment to Northern Command. The paper says the Army unit may be called upon to help with civil unrest and crowd control. The soldiers are learning to use so-called nonlethal weapons designed to subdue unruly or dangerous individuals and crowds. Greenwald: Why is a U.S. Army brigade being assigned to the "Homeland"? For the first time in 100 years, and contrary to a legal and constitutional prohibition, an active duty military unit is permanently assigned inside the U.S. just in time for the elections. What possible rationale is there for permanently deploying the U.S. Army inside the United States -- under the command of the President -- for any purpose, let alone things such as "crowd control," other traditional law enforcement functions, and a seemingly unlimited array of other uses at the President's sole discretion? And where are all of the stalwart right-wing "small government conservatives" who spent the 1990s so vocally opposing every aspect of the growing federal police force? And would it be possible to get some explanation from the Government about what the rationale is for this unprecedented domestic military deployment (at least unprecedented since the Civil War), and why it is being undertaken now? Naomi Wolf believes Sarah Palin was picked to be America's Evita Peron. One of McCain's secret advertising weapons is the fake letters to the editor. Here is what someone who volunteers for political campaigns found when the McCain put her to work making up letters to the editor. If she makes up a letter to the editor that the campaign approves of it will be sent to state and local party headquarters to find someone local to sign their name to it. The secret to success in the McCain campaign is getting their talking point in, appealing to the heart, and lies. The assignment is simple: We are going to write letters to the editor and we are allowed to make up whatever we want -- as long as it adds to the campaign. After today we are supposed to use our free moments at home to create a flow of fictional fan mail for McCain. "Your letters," says Phil Tuchman, "will be sent to our campaign offices in battle states. Ohio. Pennsylvania. Virginia. New Hampshire. There we'll place them in local newspapers." Place them? I may be wrong, but I thought that in the USA only a newspaper's editors decided that. "We will show your letters to our supporters in those states," explains Phil. "If they say: 'Yeah, he/she is right!' then we ask them to sign your letter. And then we send that letter to the local newspaper. That's how we send dozens of letters at once." No newspaper can refuse a stream of articulate expressions of support, is the thought behind it. "This way, we will always get into some letters column." Mayor Bill White of Houston described the potential range of costs to both the federal government and insurance companies in an interview with the Houston Chronicle. He then joined Galveston Mayor Lyda Ann Thomas and Texas Lt. Gov. David Dewhurst on Capitol Hill to testify before a Senate Homeland Security subcommittee on disaster recovery. FEMA — the Federal Emergency Management Agency — has not completed damage estimates that would be submitted to the federal government. "But," White said, "I would not be surprised if the total figures (for the federal government) weren't in the $20 billion to $40 billion range. We're going to be enormous." Latest insurance industry estimates compiled by the Insurance Information Institute of New York foresee privately insured losses ranging from $7 billion to $12 billion. The tally of private insurance losses, coupled with White's, provides the range of all losses of $27 billion to $52 billion. Some of the federal money is likely to come soon. Late Tuesday, House Appropriations Committee Chairman David Obey, D-Wis., unveiled details of a catch-all spending bill that includes between $23 billion and $24 billion for natural disaster relief. This bailout will benefit the people and there is transparency in the financing. If this was the Paulson plan the head of FEMA would be demanding $30 billion right now to dole out as he saw fit to crony contractors he picked with no oversight to make good the losses of large corporations in the Houston area. Let's Play "Wall Street Bailout" - NOT! You might want to spike that latte. Bilmon was one of the best bloggers from Wall Street but who had retired from blogging until recent events forced him back. It is pretty bad when the only responsible sensible thing for a private citizen to do is to buy gold and horde oil and food and hold no dollars. I wouldn't invest in oil stocks now - whoever is in charge of government in 2009 will need lots of money and taxing oil companies will be the politically easiest way to get it. The FBI is investigating Fannie Mae, Freddie Mac, Lehman Brothers Holdings Inc. and American International Group Inc. in its probe of the collapse of the subprime-mortgage market, according to a senior law-enforcement official. The fix appears to be in for the Democrats to be responsible and approve something to bailout these crooks while half the Republicans do the same thing. Still questions and a list of responsible things needed in any plan. But the bomb has yet to detonate. The bomb is the debt that has now been transferred to the taxpayers. Andrew Sullivan, and the recent trumpeting from many small elephants, is wrong, workers did not cause this crisis. The spreading racist rants in the conservative media is that this crash is caused by minorities taking loans they can't pay back. This is crap. This is just the racist stuff you here from the right everyday but will strike a chord among angry taxpayers. I don't have the links now for the following but watch in the coming weeks. The real damage has moved beyond sub-prime mortgages and into the unregulated trillions of dollars in the hedge funds and swap markets and the falling confidence in the US government, financial institutions, and the US dollar. Only when the dollar crashes hard will we know the extent of the damage. Perhaps it will be better to let the Dow fall to 8000 before any major intervention. That is what brought on this proposal - unless we inject a trillion dollars into Wall Street the market will crash. I think the money might be better spent on rescues or whatever the people decide after the crash when we know the real values of some of these firms and assets. It is ironic too that the bankruptcy laws designed to stick it to the less well off are hurting corporations who aren't now given enough time for orderly sales of assets but must make immediate decisions when they are most vulnerable. Should the Democratic majority in Congress stall until they get a good bill that pushes most of the decisions on to the next president? To do otherwise allows the Republican conservatives to claim Democrats are responsible both for the depression and the bailout of the fat cat millionaires. Of course, they will claim that if Obama wins anyway. There are economic decisions that need much more time than this administration is willing to give to push through their terrible plan. Remember- tell your representative to just say NO to Bush and Bernanke and Paulson proposals. Damn, Bill Clinton didn't want to praise Barack Obama and Chris Rock noticed. Milestone - this is post 15,000 in this blog. My main other blog stands at 2002 posts now. I think I could use one of those hurricane drinks about now. This seems a good summary. Here will give you Seven reasons to vote NO. Ok, here is my nine combining those two. It provides no oversight, gives unchecked power, is unfair toward homeowners, rewards irresponsibility, uses money we need for other programs, won't solve anything, assumes expertise the government doesn't have, there are way better solutions, and gives this tremendous power to people who haven't handled power well. It's Monday, and that means it is time for another edition of the Great Texas Progressive Alliance's weekly roundup. This week's roundup is compiled by Vince from Capitol Annex. stop PDiddie from posting the rumors at Brains and Eggs. Mike Thomas at would fight for San Antonio's share of federal funding based on his latest ad blasting all Congressional earmarks as wasteful "pork". Vince at Capitol Annex tells us that State Rep. John Davis is up to his same old tricks down in HD 129. This time, he's holding a fundraiser in Austin while his district is without power, and his constituents are without water. He's clearly addicted to campaign cash. Someone throw this guy a roll of quarters before he has a stroke. Conservatives like Michelle Malkin turn against bailout plan. 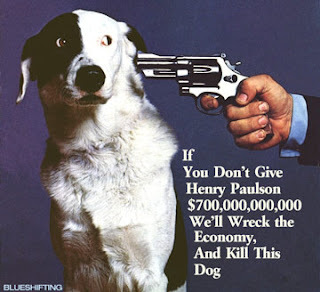 The reason is my last post - why would anyone trust $700 billion with Henry Paulson? Although Malkin somehow manages to complain about Paulson's "Democratic DNA." Why would you give a $700 billion blank check to someone who is always wrong? When the serious condition of the markets were explained to the leaders of Congress they were shocked. Of course. They have been listening to the one guy, Treasury Secretary Henry Paulson, who has been consistently wrong and who kept reassuring them he had a handle on the problems. Dean Baker - Paulson Missed the Bubble and Understated the Financial Crisis at Every Point. Of course Paulson is not the worst - how about one of McCain's economic advisors who one week ago wrote in an article criticizing Obama and the media: "we're on the brink not of recession, but of accelerating prosperity... anyone who says we're in a recession, or heading into one -- especially the worst one since the Great Depression -- is making up his own private definition of "recession." And probably for his own political purposes... when it comes to the economy, we have surely become a nation of exaggerators." He is also the incredibly stupid economic writer at the National Review. Donald L. Luskin is also a liar or a fool or both. He once included in a speech attacking Krugman, and about meeting Bush and agreeing with his tax cuts, that "I'm not a Republican and I don't think of myself as a conservative." Also, is it time to upgrade our real life presidential election game? Not so quick, according to a team of UCLA researchers. Studying satellite imagery of night light in Baghdad neighborhoods dominated by Sunni residents, they came up with an alternative conclusion: The Sunni Muslims and Shiite Muslims had largely stopped killing each other by the time the "surge" of U.S. troops arrived in 2007. In other words, the remaining Sunnis, defeated, turned out the lights and left. And then the U.S. troops came in. My suggestion of an email or phone call to stop the United States from appointing an economic dictator. It is nice they made the proposed trillion dollar bailout law so clear: Decisions by the Secretary pursuant to the authority of this Act are non-reviewable and committed to agency discretion, and may not be reviewed by any court of law or any administrative agency. Vote NO on this trillion dollar taxpayer bailout in its present form. This $1 trillion bailout of the financial industry shouldn't be pushed through a blindsided Congress. This economic act funded by taxpayers to rescue Wall Street must include tough regulation, severe consequences, action on behalf of American homeowners who face foreclosure, and oversight by Congress and the Courts. Companies that make a comeback must PAY BACK the taxpayer for this bailout. The institutions that brought us taxpayers and voters this mess are in no position to make any demands. The present bill gives the Treasury Secretary more power than the President over the economy with no restraints or oversight on how he uses his power. This is not how a Democratic Republic works. Vote NO. Do it Sunday or early Monday - Bush is trying to ram through this unconstitutional takeover Monday. I have been saying that for years. When you look at the macho arguments of all these conservatives you really see frightened children, yellow-bellied cowards. Now scientists say they see a genetic link between how easily someone is scared or startled and how conservative politically they are. They are cowards and will give up quite a lot not to be scared. You notice it in Republican political ads - they will play ads featuring ominous music, or wolves, or black men, or terrorists, or bombs and try to reinforce the FEAR! factor to get more votes. Conservatives don't want liberty and freedom - they want to be protected because they are scared. UPDATE - Welcome Houston Chronicle readers. Over a year ago I recommended kicking out Sen. Cornyn as too cowardly to represent the Lone Star state. This is a bad deal, a very bad deal. It seems all too likely that a “fair price” for mortgage-related assets will still leave much of the financial sector in trouble. And there’s nothing at all in the draft that says what happens next; although I do notice that there’s nothing in the plan requiring Treasury to pay a fair market price. So is the plan to pay premium prices to the most troubled institutions? Or is the hope that restoring liquidity will magically make the problem go away? I'm quite convinced that some drastic action needs to be taken to avoid a cascading and debilitating series of crises. But the more I look at this plan, the more wrongheaded it seems. But if I'm understanding this deal, the taxpayers are going to pony up close to a trillion dollars to take bad debts off the hands of financial institutions who were foolish enough to make the deals in the first place. And in exchange, I think the tax payers get nothing? I would guess that this has to be one of the biggest peacetime transfers of power from Congress to the Administration in history. (Anyone know?). Certainly one of the most concise. The Treasury Secretary can buy broadly defined assets, on any terms he wants, he can hire anyone he wants to do it and can appoint private sector companies as financial deputies of the US government. And he can write whatever regulation he thinks are needed. I understand that they wanted freedom to respond and an ability to move quickly, but to designate the Treasury Secretary full power to oversee the, uh, Treasury Secretary's decisions seems unusual. So, for the next three months, and then an additional six months after that, the Treasury Secretary can do anything he deems appropriate without anybody anywhere looking it over. Larisa Alexandrovna writes THIS LOOKS LIKE A FASCIST TAKEOVER!!! No time needs to be wasted on hearings as we already now have in writing, formally as presented to Congress, the intentions of this administration to nullify Congressional powers permanently, to alter Judicial powers permanently, and to openly steal public funds using as blackmail the total collapse of the US economy if these powers are not handed over. You do see how this is blackmail, do you not? You do see how this is a manufactured crisis precisely designed to be used as blackmail, do you not? The other option, the one I have long prayed we would never need to even consider, is a total revolution. But, If Congress won't act in its own self-defense, in the defense of democracy, in defense of us - the people who have elected them to protect us from this very danger - then what is left for us to do? I don't want to see it come down to this, but I fear that it will. The top financiers from Wall Street who wrote this bill say no compromises to allow oversight or protect consumers. Brad DeLong says this bill makes the next Treasury Secretary an economic Czar. With truly extraordinary speed, opinion has swung behind the radical idea that the government should commit hundreds of billions in taxpayer money to purchasing dud loans from banks that aren't actually insolvent. As recently as a week ago, no public official had even mentioned this option. Now the Treasury, the Fed and congressional leaders are promising its enactment within days. The scheme has gone from invisibility to inevitability in the blink of an eye. This is extremely dangerous. The plan is being marketed under false pretenses. Brookings Institution: Concerns about the Treasury Rescue Plan. The Bush administration sought unchecked power from Congress to buy $700 billion in bad mortgage investments from financial companies in what would be an unprecedented government intrusion into the markets. Democrats and Republicans faced off Sunday over the US government's landmark request for 700 billion dollars to bail out financial institutions as Democratic lawmakers insisted that ordinary homeowners be offered relief, too. Every reader of this blog needs to wake up Monday and phone their Congressman and Senator about the frankly silly bailout proposal. We need serious solutions to an existential crisis, and the Bush administration offers up clown shoes. No to giving one appointed cabinet officer practically the entire federal budget without any chance of oversight. No to punishing ordinary people with punitive loans and taxes that will amount to over $5,000 for every taxpaying American* while bad actors in Wall Street get rewarded beyond their wildest fantasies. This proposal must be scrapped, and anybody who still serves finance lobbyists needs to sit down in shame, and then we can talk about what to do. Be polite but firm. The media is starting to wake up. LA Times - The White House submits a proposal to Congress seeking unprecedented authority with no oversight. Will Obama Raise My Taxes? Let's Find Out. Input your tax info and find out how much he will raise your taxes! Finally recognizing the size of the problem, Federal Reserve Chairman asks taxpayers to be on the hook for a trillion dollars to prevent economic collapse. Conservatives stunned - what happened to the free market? What is the difference between this solution and socialism? None. Julius Rosenberg send non-atomic secrets to Russia but the government framed Ethel to get to Julius. The case seems almost closed - link includes podcast. Timothy Egan - Sarah Palin as a fine example of the cronyism party. Maureen Dowd - Barbies for war - another visit to Sarahtown. Gail Collins - Who is McCain this week? Some intelligent discussion on the financial crisis - it ain't over. The big concern around her and other places near Houston is when is power coming back. Particularly as some people have it and some don't. Much of Harris County will not have power until after Monday. "It will take until Oct. 1 to fully restore CenterPoint's service area." Here is the official CenterPoint Energy page with lists and Southeast Texas maps. The links on that page to the right are better than the center list of when zip codes will be 80% restored as it has actual percentages of restoration and even some maps. I hadn't linked here the damage pictures at this house. Now you have it. How has your property fared? Here are Baytown stories. They had it a bit worse than here. It wasn't the lazy crooked stupid customers buying homes they couldn't afford. It was much more the crooked greedy financial workers at all levels. This was done by crooked thieves in ties and white shirts who transferred billions in wealth from the poor many to the fortunate few - themselves. Now that this no longer works, see here for why, it is tax-payer funded bailouts for the elite. They may let some of the shareholders go under along with the worker's mortgages but they want to keep as many of those rich Republican jobs around as possible. By Dean Starkman in Columbia Journalism Review. How many supporters has McCain lost? McCain is certainly losing friends fast, isn't he? [McCain's Biographer Elizabeth] Drew's condemnation comes just a couple of days after Richard Cohen's. Which came a couple of days after Stephen Chapman's. Which followed Michael Kinsley, Thomas Friedman, Sebastian Mallaby, Joe Klein, E.J. Dionne, Jr., Ruth Marcus, Mark Halperin, and Bob Herbert. Even David Brooks is getting there. Doesn't know who the Spanish prime minister is, lumps him in with Latin American dictators who he will stand up to, may not know that Spain is in Europe. McCain's spin doctors are out but the patient is hemorrhaging. Maybe McCain should go back to telling us we need to pay more for health insurance so we would be more responsible in our choices. Today it is so-called conservatives who are cemented to political programs when they clearly don’t work. The Bush tax cuts—a solution for which there was no real problem and which he refused to end even when the nation went to war—led to huge deficit spending and a $3 trillion growth in the federal debt. Facing this, John McCain pumps his “conservative” credentials by proposing even bigger tax cuts. Meanwhile, a movement that once fought for limited government has presided over the greatest growth of government in our history. That is not conservatism; it is profligacy using conservatism as a mask. As he states clearly, Republicans are now the party of "abstract theories and utopian schemes". Witness the failure of deregulation currently costing taxpayers tens of billions and financially destroying countless people, or the failure of utopian schemes to "defeat evil" around the world, costing us thousands dead and closing on a trillion taxpayer dollars. Yet Republicans shrug off the painful lessons and insist on staying the course. The results are irrelevant, their ideology trumps all. But when you get past ideological blinders, it's clear that modern-day conservatism has utterly failed. If reality-based conservatives want to claim Obama's pragmatism and realism are "conservative", then all the power to them. I like charts and graphs. Easy way to see things - I'll send you to the links to look at them. Home Prices - inflation adjusted long term graph. Real home values, real Dow and real savings rate. People should strongly consider TIPS - Treasury Inflation-Protected Securities. A big caveat remains - how much is the BLS lying about the CPI? Quite a bit actually. A second question - is the GOP even good for the wealthy - if you count wealthy as those with the top 5% of income? They look good for only the top 0.1%. What does Houston's own Bonddad say? It's hit the fan and practically every American financial institution is struggling to avoid bankruptcy. I said a few weeks ago that those high CD rates from Washington Mutual and Wachovia was a desperate attempt by them to raise relatively low cost cash. Within two weeks I expect to see them merged or go under. Some good reporting at the Houston Chronicle, which has never been better than with covering Ike and recovery efforts. There has been no real investigative reporting but I have giving up expecting that from the Chronicle. Cleveland Hendricks found his door already open when he got home. The hurricane had let itself in, knocked over chairs, drenched the carpet, coated laundry with mud and flipped the refrigerator onto its side. The house was built in 1938, 20 blocks from the Seawall, and never flooded before, Hendricks said. It belonged to his grandmother, and he had expected it to be dry. The 49-year-old musician brought a pickup to load with drums and studio equipment. Instead, he lifted a soggy sound card from the floor and let the water drain out. The equipment was ruined. "I can salvage these," he said of his waterlogged drums. Virtually every downtown business was flooded with more than 5 feet of water, leaving their first floors destroyed. Bill Doherty, who runs an environmental cleanup company and lives in downtown Galveston, said his teams have been working nonstop since the winds quieted Saturday. "I want to concentrate on getting businesses cleaned up so they can open," said the 35-year-old Navy veteran. "If people have a place to work, this place can come back. If they don't, it simply will take too long." I saw this handy little chart that shows the changes in tax rate by size of population. I don't support Obama for this reason, our household gets a slightly bigger tax cut from McCain but that is because we are relatively well-off, but it is simply fair that those who can afford it be asked to pay their fair share. The McCain plan is that as you make more we will cut your taxes more - which is always the Republican plan but sometimes they are not as open about it. Ironic Question Time - Do you really think that Lynn Forester de Rothschild, a card carrying member of the Illuminati and a member of the Council of Foreign Relations, is supporting McCain because Obama is too elitist? It's her pocketbook and prejudices she is supporting. Update - Freakonomics looks at three charts with this same data. Want to take a bet that we get to Omar and its a killer? Hurricane Ike's effects have been devastating. It's critical we get millions of Texans the help they need. I reported to Camp Mabry, serving with the 36th Division Headquarters, Texas Army National Guard, with the G-3 section charged with operations and planning. During this time, I am canceling campaign events. I encourage you to volunteer with your local Red Cross. And please consider making a donation to the Red Cross. Elizabeth Bear needs at least a hug for posting this. May the funniest, most humane candidate win. Elizabeth is beating the writing system even with the self-induced death spiral of Borders and the cluelessness of B&N. Tobias tells about the writing business these days. FastFwd has more with lots of writer and reader comments at both. I had commented on the sad state of US publishing while waiting for another possible hurricane a month ago. Meet the Stars - how to spread science. While we were experiencing a touch of global climate change on the Gulf Coast the stock market got hit with a bit of the next economic tsunami - no more Merril Lynch and Lehman Brothers and the world's largest insurance company American International Group Inc. is tottering. "In a statement released by his campaign, McCain called for greater "transparency and accountability" on Wall Street. If McCain wants to hold someone accountable for the failure in transparency and accountability that led to the current calamity, he should turn to his good friend and adviser, Phil Gramm." - David Corn at Mother Jones. I've been using Live Journal to catch up with a bunch of friends regarding Ike. Nothing too bad. While I found nothing bad, Glenda did find someone, by email I think, at FRED who lost her house down at San Leon, ouch. Escape Pod - Reparations. Mary Robinette won the Campbell award for best new SF writer. Elizabeth Bear above won her first Hugo Award. What do you expect when you turn FEMA into a partisan spoils system for people who don't like government? How about incompetence, death and cover-ups? Is that what has happened on Galveston? Why is there a no fly zone over most of Galveston for the news media? I know FEMA has been sending 200 trucks back and forth to San Antonio each day - 95% empty. I know they forgot to supply their first responders with food and water. I know that the State of Texas, which all week said they were going to supply the food and water and said they were well prepared on the day after said no - local communities should do that. Now there is a media lockdown and there seems to be some confusion as to when to declare an Ike causualty. Are there really hundreds of floaters at sea as rumors have it? Here is what is known about Galveston. But hey, at least Galveston isn't important like New Orleans. And who even knows where Orange is was? Curfews and dark but civilization starting to return. But the Balinese Room is gone. The Red Cross is doing a good job. Remember these are all volunteers. You don't pay their non-salaries. If you have a complaint you should just volunteer and do it yourself. They'll teach you how. FEMA is Bushed. Local governments are coping as best they can. Coordination, which would be FEMA and Homeland Security's job, is pretty poor. But heh, I got to be in the biggest damn eye of a hurricane eveh and we are doing OK even if without power. And Bush is going to be touring the area and maybe a bunch of us could get together and trickle down on him. Catch him and hold him for me. Who's Gonna Build Your Wall, Boys?